What a FAB and FUN design! Im going to try this. What a great idea. Thnks, Sandy. Great tags! I know that these tags would be a great hit with my friends and family! TFS! These tags are fabulous and I love that they’re interactive. Would love to win one of your creations…thank you for the chance. I love interactive cards/tags. Kids would love having a tag like this on their package. An adult would love to have one on their package. They turned out so cute. I am going to try to make tags with sliders. My great grandkids will love them. Thanks for such great tag ideas and designs! Penguins are too stinkin’ cute! you can never have too many penguins. thanks as always for sharing. Adorable! Who needs a gift? This tag IS the gift! I LOVE your slider penguins!!! I am really enjoying this tag series. I think it’s not so overwhelming if I just do a set number per day. Keeps it fun and I get a lot accomplished without burnout! Gosh I love this tag! ! It just makes me giggle! Soooooo cute! Happy, happy tags! PENGUINS!!!!!!!!!! why YES! they are toooooo stinking cute! Now I need to get these…. I’ve always used a penny for sliders I’ll have to give this method a shot! So adorable! Your tags are so well put together. Sliding penguins! They are terrific. 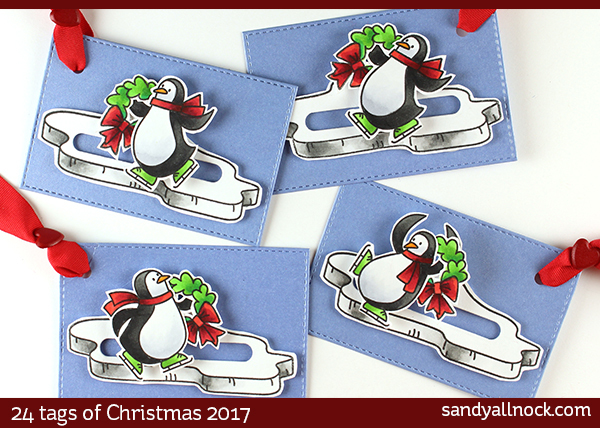 These penguin tags are “slider”-ific! Love the slider tags! Adorable! Just precious tags Sandy, I totally prefer die cutting. I want a sandy tag to frame a reminder to me that gifts given to us by our creator are to be enjoyed and given away. I love your smile and ideas. Love the penguins! I am not a big fussy cutter, mainly because I have a scar at the outside base of my thumb which makes manipulating scissors for any length of time painful. I am seriously thinking about a third option, one of the scan and cut machines. (Hint, hint, Santa!) LOL! Such adorable tags. Love the penguins. Cute! You go through a lot of work for a tag, but it’s SO cute! Re: to die to not to die….Aside from basic shapes, I generally don’t buy the dies unless I have a plan to make a quantity of a card. They are too much expensive and really unnecessary for limited use. I wish dies weren’t so much $$. I am considering investing in a Brother Scan and Cut machine (no computer required). Big upfront cost, but maybe a better long run deal. I’m about to attempt my very first slider this weekend. Thanks for the inspiration, Sandy! Hope all is going well in your life and that Vienna is making a good recovery. The tags are so fun. Very cute. Oh so cute. You make the sliders look easy to make. I need to try what you did. So happy to see your awesome tags. These penguin slider takes are ADORABLE.. I’ve been watching your entire tag series, I’ve figured out how to watch them on my big TV in my family room, but then I can’t comment! I’m not good with electronic gizmos, and my son is one of those “IT professional” folks–he sets all of this stuff up and then teaches me which button to push! I love your Bible journaling gift suggestions too–thank you! Great and funny tags. Thanks for al those beautiful things you made. And no, I am not an die cutter for my stamped images. My craft-piggy is not big, so I have to make choices. The choice to cut by hand and buy 2 stamps is better than buy 1 stamp with the die. Love these cute interactive tags. Love, Love, Love the Penguin tags…..soooooooooooo cute! So easy too!! Thanks for sharing! You are the best! OMG, these just keep getting cuter and cuter each one. I love how it looks like ice. I am heading to the you tube video to see how you did that, I love watching you color. Thanks. I really love these little penguin tags. My grandchildren would be so excited to get these on their gifts for Christmas! These are darling! You’ve inspired me , Sandy!